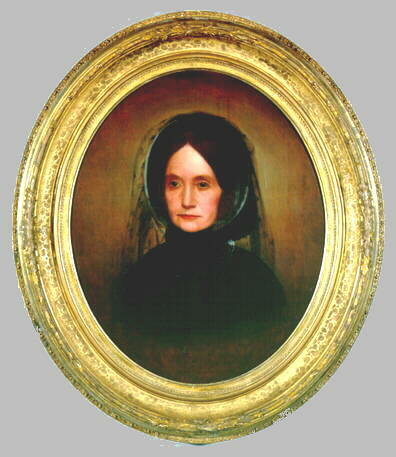 Jane Dale Owen was one of two daughters of the British social reformer, Robert Owen. She and her four brothers resided in the town of New Harmony, Indiana, which her father had purchased in 1825. Jane moved to New Harmony in 1833 not long after her mother and sister had died in Scotland. In 1835, she married Robert Henry Fauntleroy, a civil engineer from Virginia who partnered with David Dale Owen, and then Robert Dale Owen, in a castor-bean enterprise in New Harmony. Fauntleroy became more lastingly known, however, as an officer in the U. S. Coast Survey. His death in 1849 was a loss from which his wife never fully recovered. Image used by permission of Indiana Department of Natural Resources, copyright © Indiana State Museum and Historic Sites. Based on a daguerrotype; artist unknown. Few traces of Mrs. Fauntleroy's school and teaching have survived, but one exception is a series of advertisements that ran in the Indiana Statesman, from August, 1844 to October 4, 1845. The ads described Mrs. Fauntleroy's seminary, or home-school for young ladies. Probably the ad tells us more about her school—now the historic Old Fauntleroy Home in New Harmony—than any other record. Costs for boarding and individual courses are given. Scientific instruction was given by her brother, Dr. David Dale Owen. My daughter—the only one now living—married a gentleman who was long employed as an efficient officer in the coast survey of America, lately suddenly deceased while employed in this service, in which he was so respected by his brother officers, that they have resolved to raise at their expense a monument of his memory. His now deeply afflicted widow has, from her childhood, ever been considered a pattern of a daughter, friend, wife, and mother; and her society has been courted by every circle into which she has ever been introduced. At the time of Jane's visit, her father, Robert Owen, was 82 years old. It was now 28 years after Owen's purchase of New Harmony, Indiana, and about 13 years after the Owenite movement had peaked in England. The "New System" in Jane's letter refers to Owen's principles for social reform; "the spirits" refers to Robert Owen's adherence to spiritualism in his later years.